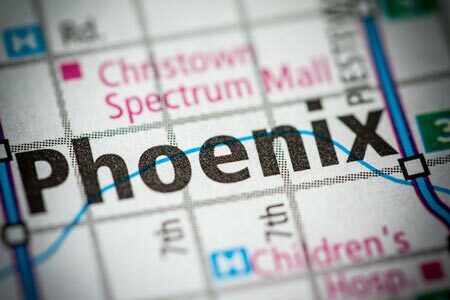 Phoenix, Arizona—An unidentified 17-year-old girl was killed in a hit-and-run accident as she crossed a street at 78th Avenue and Osborn Road on Monday night. Lamar Ross Mays, age 36, has been arrested in connection with the crash. According to Phoenix Police accident investigators, Mays was driving westbound on Osborn Road in a Jeep Patriot when he reportedly struck the teenager as she crossed the street at 78th Avenue. Mays allegedly continued driving. Another driver who witnessed the collision followed Mays to a Fry’s supermarket parking lot at 83rd Avenue and Indian School Road. Mays got out of his vehicle, apparently to inspect the front for damage. He returned to his Jeep and started to drive away when he was stopped by police officers. The teen was transported to a trauma center where she was pronounced dead at 10:00 p.m.
Police records show that Mays, a Marine Corps veteran, was impaired at the time of the crash. He was arrested and jailed on suspicion of manslaughter and failure to stay with an injured person. His bond is set at $50,000. His initial court appearance is scheduled for Tuesday, July 25th. We extend our condolences to the family and friends of the young victim over this tragic loss, which is made worst by the conduct of the driver.